We are very excited to bring you a world exclusive! Here are the first pictures of RD-400, the dual-graphics solution from ATI that will compete with Nvidia's SLI. 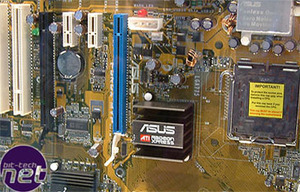 We spoke to an Asus representative today who told us that this board was still 2 months away from release, but would support forthcoming graphics cards from ATI with a bridge connector. 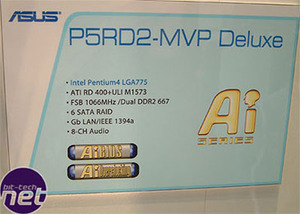 As with SLI, ATI's MVP solution will deliver additional performance through the use of dual cards, rather than simply more monitors. 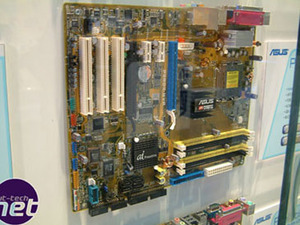 The board will be for Intel processors, at least initially. 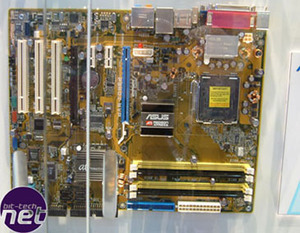 We are pretty sure that this board wasn't meant to be on show, but Asus' mistake is the bit-tech reader's gain! For now, revel in these pics until we get more out of ATI.